Happy Monday! I am amazed at all of the whining and complaining on social media and in general about Mondays. I think everyday has the potential to be a good day, some days are just better than others. Today was one of those days where it looks beautiful outside, sunny, no clouds, you think it is warm, but once you step outside the wind is blowing like crazy and you are freezing! I can deal with cold, rain, and heat but I cannot handle windy, blustery days. I read an article in a college course about how changes in barometric pressure “wind” can have negative effects on humans. I totally believe it, but I did my best to make the most of this Monday and not get blown away by the 50 mph wind gusts! I got dressed in this and thought I was good to go, the weather lady on the news said it would be 70 degrees and I thought I would be fine. 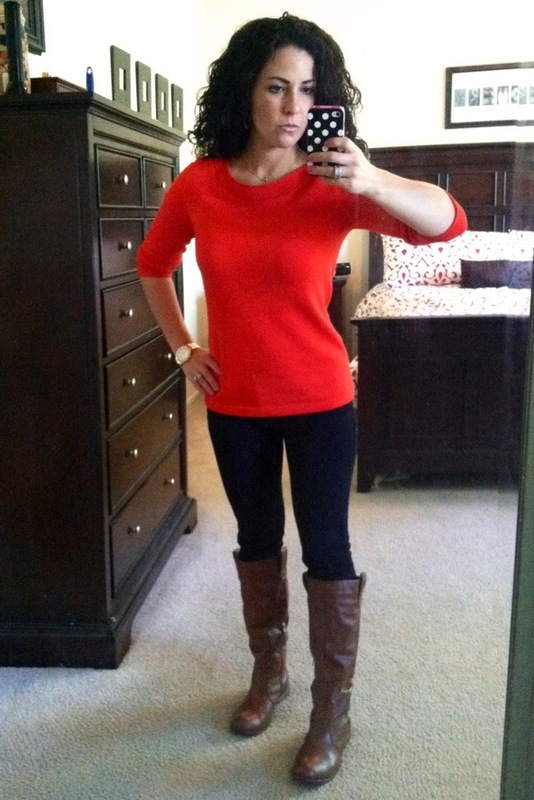 Vermillion (orange-red) boatneck three-quarter sleeve sweater from Banana Republic $10. 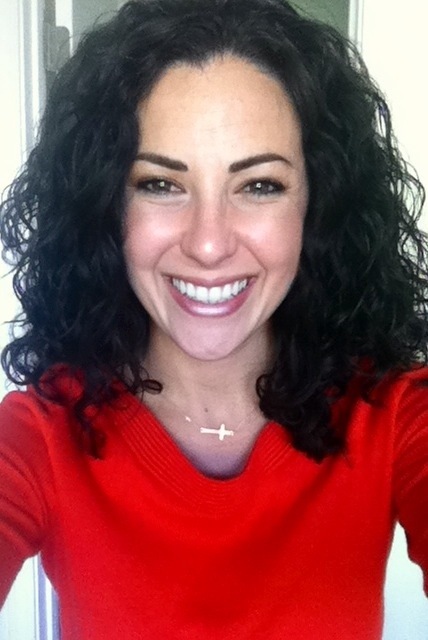 I went to the outlets yesterday and had to buy this sweater, I already have it in navy and white and I love the fit, style, and color! I know I will wear all of these sweaters next fall, winter, and spring so they were a good buy! Black jeggings from TJ Maxx, $11.99, bought fall of 2012. 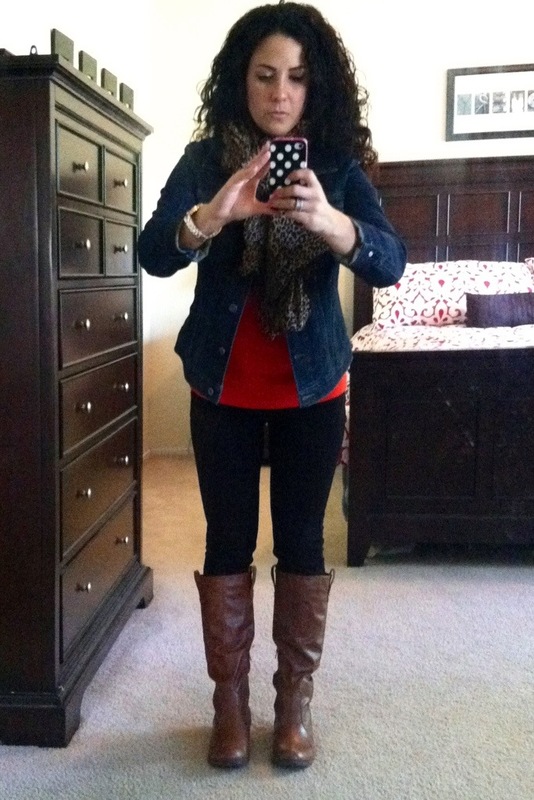 I love jeggings/leggings/stretchy pants! Talk about comfortable, I feel like I am wearing a pair of yoga pants to work when I wear these and they are so versatile. 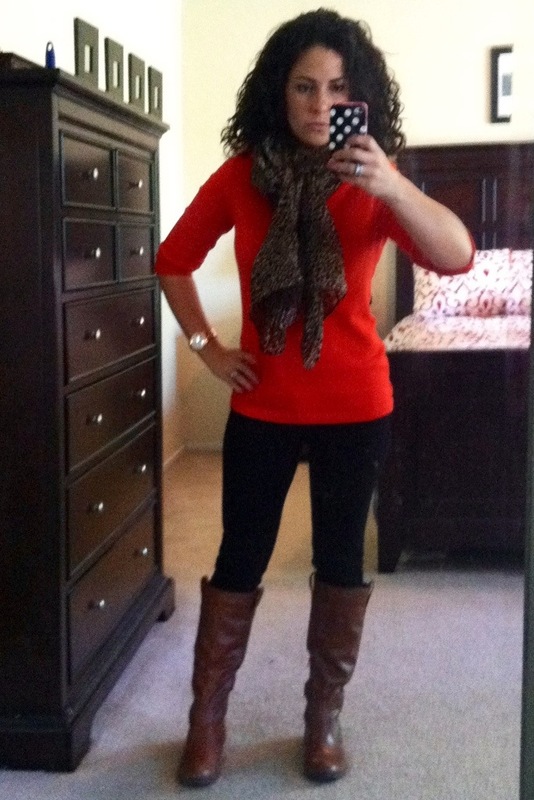 Tan Riding Boots from UrbanOG $32.90, gift from my husband this past fall. I am still digging rose gold! I wore my Badgley Mischka watch, details here, cross necklace I bought yesterday, details here, and rose gold and rhinestone earrings, details here. I thought I might be a little cold because of the wind so I threw on my favorite leopard print scarf that I bought at my local flea market for $5 last winter. I promise I will do a post on the flea market when I am on summer break. There are so many good deals! I can’t wait, only seven more weeks until I am on vacation! Well, the scarf wasn’t cutting it. When I put my son in his car seat I realized I was going to need a jacket. Gap jeans jacket bought several years ago at the Gap outlet, not sure on the price. Sometimes getting dressed can be a major ordeal, it’s all about layering and being comfortable. Those were the keys to starting my day in the right direction. I had a great Monday! I was able to go to Bikram yoga (hot yoga) this afternoon, had a fabulous dinner with my family, and watch all my DVR’d Real Housewives shows! I hope you had a fabulous Monday! Thanks! For the price, these are amazing boots that have held up well over the winter. I think Sundays are my least favorite day. I always end up thinking about how the weekend is almost over and I have to go to work the next day. It’s mostly just Sunday evenings I despise! I don’t know which is worse to dislike Sundays or Mondays! Either way, I’m glad it’s Tuesday! Thank you! For $2.80, I had to buy it! Girl – you look so bright eyed and bushy tailed for a Monday! And I had the same evening as you – hot yoga AND Real Housewives catch up. Wanna be roommies? Thanks doll! I have been working in my attitude, yoga, coffee, wine, and RH help! If something ever happens to my husband I will for sure be your roomie! Beautiful smile! I think I have to work on my Monday mood :) but I will follow your lead and get a cute scarf to cheer me up! Thanks so much for giving eyveonre remarkably splendid possiblity to read articles and blog posts from this site. It is usually so terrific and also stuffed with a good time for me personally and my office friends to visit the blog really three times in 7 days to study the new tips you have. And definitely, I’m always fulfilled concerning the remarkable concepts served by you. Certain two areas on this page are in reality the finest we have all ever had. I’m commenting to let you know what a heplufl encounter my friend’s child gained visiting yuor web blog. She came to find some issues, with the inclusion of what it is like to possess a very effective giving mindset to get many more very easily gain knowledge of selected complex things. You truly exceeded our desires. Many thanks for churning out such precious, trustworthy, informative and even unique guidance on that topic to Ethel.